Toruń has good connections with other Polish or European cities. Important routes have always passed through Toruń. The Toruń road jounction is composed by three important national routes: No. 91 and A1 motorway (European No. E75): Helsinki-Gdańsk-Katowice-Budapest-Athens, No. 10: Warsaw-Szczecin and No. 15: Olsztyn-Wrocław (and Poznań). A1 motorway is a fast and easy connection from Toruń to the north and south of Poland and such a cities as Gdańsk, Łódź, Częstochowa, Kraków or Zakopane. • Traffic restrictions in the city centre of Toruń here. Driving licences issued in other countries are generally valid in Poland. A driving licence issued in an EU country is valid throughout the EU. You must carry on a valid driving licence and vehicle registration document. The wearing of seatbelts is obligatory. The headlights must be on day and night. Speed limits in Poland: built-up areas: 50 km/h, outside built-up areas: 90 km/h, motorways: 130 km/h. Poland has strong drink-driving laws: 0.2‰ is the maximum blood/alcohol limit, so forget about having even a single beer. You can get to Toruń by direct train from almost any Polish city and town. The extensive Polish rail network is operated by the PKP (the Polish National Railways) and the Arriva PCC (in the region of Toruń). If you tend to purchase your ticket on the day of travel then allow at least half an hour for possible queues. A seat reservation must be made for the Intercity and express trains (phone number: 2219436 or: 19757). 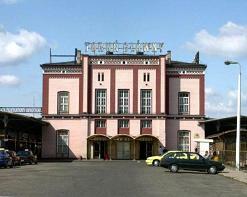 Toruń's central railway station: Toruń Główny is not located - as in many other cities - in the city centre. In any case it is important rail junction in Poland. Each train that arrive or pass by Toruń stops there. Usually trains stop for a couple of minutes or longer and some already at the platform well before departure. The main hall is not impressive, rather poor (as well as the station surroundings), so don't expect your first impression on Torun to be good when you see that. However, the beauty of old Toruń will recompense it. To get to the city centre you have to take a taxi or a bus. The station is served by the following bus lines: 22, 25, 27. Bus ticket (Polish: Bilet) is 2,50 PLN and can be obtained at any kiosk. The bus journey will last up to 5 minutes; route will run across the bridge on the River Vistula from where you'll have a possibility to admire splendid panorama of Toruń Old Quarter. More on the public transport here. If you take a taxi the journey to the Old Quarter will cost some 15 PLN. There are other smaller stations in Toruń including Toruń Miasto and Toruń Wschodni. There are some 12 direct trains from Warsaw to Toruń a day, but not each of them runs every day. The journey takes some 2 hours and 35 minutes and costs some 42 PLN. For detailed time-table and furhter information check up here. Regular coach services operate from Toruń to many domestic and European cities. 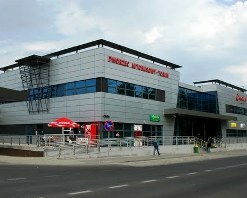 The main coach station (Dworzec Autobusowy) is located in the city centre (8-24, Dabrowskiego Street). Local, domestic and international services operate from this station. The Toruń bus company that both operate many lines and run the coach station is Veolia Transport Toruń. Coach drivers sell tickets if there are unreserved seats. There is no surcharge for this service. Many regular connections with cities in Germany, Belgium, the Netherlands, England, France, Norway and Italy are established by Eurolines Polska operator. The current airport in Toruń doesn't operate regular flights. The nearest airports with a good air connections with a number of European cities are located in: Gdańsk (170 km north of Toruń), Poznań (150 km south-west of Toruń), Warsaw (210 km south-east). The Toruń Development Strategy document of 2007 envisages the modernization and expansion of aviation infrastructure in Toruń, which is adaptation the current airport to the function of cargo terminal and non-scheduled passenger flight checks. Although 52 km west of Toruń there is airport in the city of Bydgoszcz (>>>) but it doesn't provide a satisfactory network of flights. The budget airlines operate there but they even reduce the number of connections or just have withdrawn from here, particularly in 2009. - Lufthansa 5 times a week flies to Frankfurt, from where you can fly in more than 160 directions of the world. - Italian aircraft Mistral Air, which belongs to the Poste Italiana, on Mondays and Thursdays flies to Rome-Fiumicino.